"Lead us back to you, O LORD, that we may be restored: give us anew such days as we had of old." Sin is before all else an offense against God, a rupture of communion with him. At the same time it damages communion with the Church. 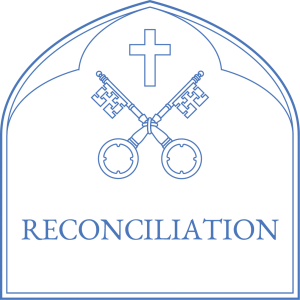 For this reason conversion entails both God’s forgiveness and reconciliation with the Church, which are expressed and accomplished liturgically by the sacrament of Penance and Reconciliation. The following is excerpted from “Celebrating Confession“, a brochure published by the Canadian Conference of Catholic Bishops. Do I centre my life on God, on fidelity to the Gospel and the Commandments? Do I set aside time for personal prayer? Do I keep Sunday by participating in the Eucharist? Is Sunday a day of prayer and rest? Do I observe the penitential practices of the Church? Do I keep Lent as a time of prayer? Do I behave as a Christian in daily and public life? Is my faith reflected in my employment? Have I taken property of others – including my employer? Am I envious of what others have? Do I share my goods with those in need? Do I respect the reputation of others? Do I care for my family? Do I model Christian life for my family: parents, wife, husband, children? Do I exercise authority with genuine concern and responsibility? Do I give others the same respect that I expect for myself? Have I dishonoured my body by thoughts or actions incompatible with Christian life? Am I faithful to my marriage? Do I set an example of committed single living? Do I live out my commitments to my spouse and my children to the best of my ability and reflect God’s love and faithfulness? How do I deal with the difficulties, failures and disappointments of life? Do I tend to the spiritual, physical and medical needs of my body? Can others see the grace of Baptism at work in my life? Deuteronomy 6. 3-9: Love the Lord your God with your whole heart. Jeremiah 7.21-26: Listen to my voice, and I will be your God, and you will be my people. Hosea 14.2-10: Return to the Lord you God. Joel 2.12-19: Turn to me with your whole heart. Welcome: The priest welcomes the penitent. It is helpful if you indicate the time of your last Confession and anything else that will help the priest hearing your confession. Scripture: A short passage of Scripture may be read. Confession: Confess your sins and listen to the advice of the priest. Penance: The priest proposes a good action or prayer to help make up for sin and deepen virtue. Prayer of Sorrow (Act of Contrition): We pray expressing personal sorrow and asking for forgiveness. Absolution: The priest grants absolution in the name of God and the Church. Praise of God and Dismissal: The priest invites you to praise God and dismisses you with the command to go in peace. We should spend some time in thanking God for forgiving us and restoring us to full life in Christ. Matthew 6.14-15: If you forgive others their trespasses, your heavenly Father will also forgive you; but if you do not forgive others, neither will your Father forgive your trespasses. Luke 15.7: I tell you, there will be more joy in heaven over one sinner who repents than over ninety-nine righteous persons who need no repentance. Ephesians 5.1: Be imitators of God, as beloved children, and live in love, as Christ loved us and gave himself up for us, a fragrant offering and sacrifice to God. – His mercy endures for ever. All-holy Father, you have shown us your mercy and made us a new creation in the likeness of your Son. Make us living signs of your love for the whole world to see.